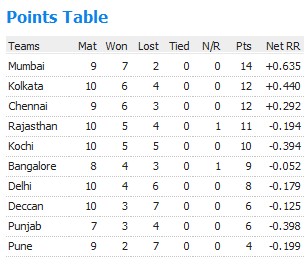 Deccan’s having won their only game against Pune, will like to make it 2-0 for this season. Pune started off in bright note, but light seems to be fading in Dada’s army as they continue their losing streak. Sangakarra who sat out last match came back as Skipper won the toss and decided to bat first. As always DC had a slow start, but they didn’t lose many wicket this time just a couple, Both Sangakarra & Cameron white stitched in a very important partnership between them and smacked the PWI bowlers out of the park as they piled up 122 runs in the last 9 overs, esp 18 & 19th overs yielded 25 runs a each, one bowled by Ganguly & Nehra. Pune also had a first ball wicket, this time Manish Pandey being the victim, Clarke who just joined the team, along with Dada try to make amends to get themselves in the game, eventhough they found boundaries every now & then it wasn’t enough for the runrate as it kept on creeping. Ganguly & Clarke got themselves out in their forties. Smith & Uthappa tried to bring themselves close, even after most shabbiest fielding display by DC, PWI fell short of 13 runs. Just Couple of days back both teams met against each other and it went till the last ball and Delhi scampered through to win with 1 run. Rajasthan will like to change the fortunes in their fortress Jaipur. Dravid won the coin battle and decided bat first on a good batting track, Royals started off to a flyer both Dravid & Rahane looked in prime form and playing strokes at their will. Once Rahane departed to a reverse sweep, score read 71/1 in 9 overs but the scenario itself got reversed, as Royals were 95/5 in no time, with 13 overs gone past them. Dravid tried to steady the thing, still he was scoring, but runs weren’t coming from the other end, which kept Royals under the score they looked for. As they completed their 20 overs with 141/6. Pawan Negi being the main tormentor who picked up 4 main key wickets in the middle overs to strangle royals less than the par score. If Royals had to win this one, they need to pick Shewag upfront, which they failed to do so, the result is written as the wall, Shewag picked up his consecutive fifth fifty to demolish royals. By the time they picked up his wicket, he finished the game and left for the icing. KP playing the last game for this season of IPL played a handy 36 in the winning cause. 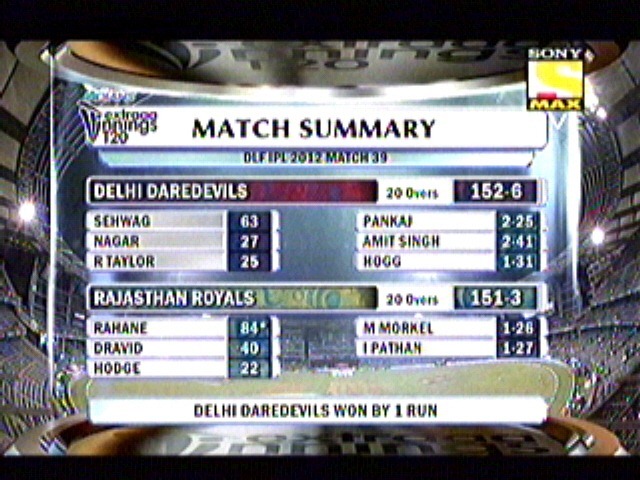 Delhi Daredevils won the match by 6 wicket & 28 balls to spare. 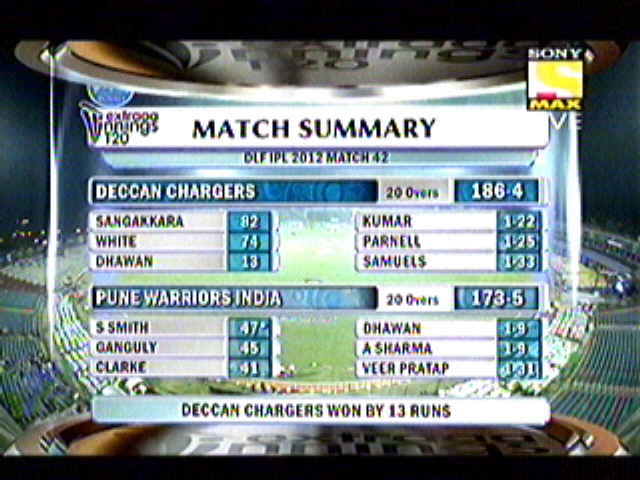 – Deccan Chargers picked up their second win of this season; ironically both their wins have come against same team Pune Warriors. – Rahul Dravid scored the 1000th Boundary for this season of IPL. – Virender Shewag became the first player in T20 history to score 5 fifties consecutively. – 157 runs between Sangakarra & Cameron White is the highest partnership for this season, they bettered Pandey & Uthappa’s 145 runs for 3rd wicket against Delhi. – 157 runs between Sangakarra & Cameron White is also the third time highest in IPL so far, falling behind 159 runs between Hussey & Vijay & 206 runs between Marsh & Gilly both against RCB. 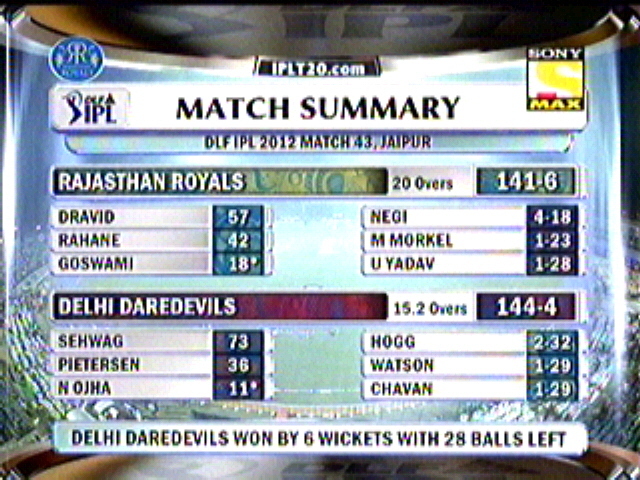 – This is the first win for Delhi Daredevils in Jaipur in the IPL history so far. – Both the innings of the match DC Vs PWI had a first ball wicket, for DC it was Parthiv Patel & PWI it was Manish Pandey. 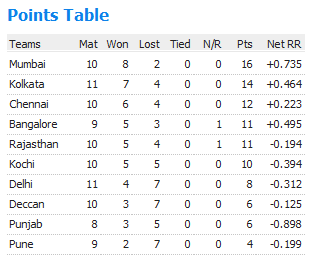 – Shewag also is now second in the list the most no. of fifties scored in IPL with 13 to his name. Kallis & Gambhir top with 14 to their names. Due to some unexpected office works I was held from the evening to midnight, and both the matches got missed. So nothing more to have a say now, it all done and dusted. Overall both the matches were almost one sided as there was no contest between bat and ball by any means. Chennai’s dismal show of running between the wicket, and Gayle’s mistimed pull were the down under of the day. Hope the champs are back in form very soon. Just got the stats from the website, so just updating it for the day. – 9 out 0f 21 times team batting first have won in Bengaluru. – 53 is the fastest team fifty for this season, which came in 5.1 overs. – 5 Number of batsmen to get run out in the game – the most in an IPL encounter. The Mumbai Indians (5) v Kings XI Punjab (0) match at Mumbai in 2008, and the Delhi Daredevils (2) v Royal Challengers Bangalore (3) match at Bangalore in 2010 also witnessed five run outs each. – Murali Vijay became only the second batsman in IPL history to be dismissed without facing a ball. Interestingly, the only other such instance also came for Chennai Super Kings against Delhi Daredevils, at Durban in 2009 when L Balaji was run out without facing a ball. – 40 Delhi Daredevils won the match with 40 balls to be spare – the biggest defeat for Chennai Super Kings in terms of balls remaining. 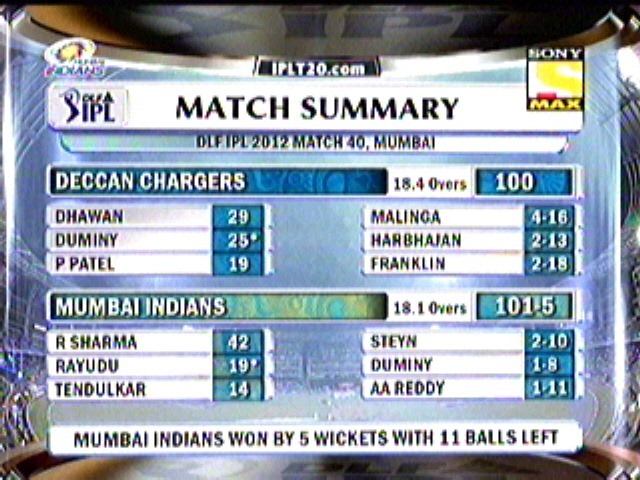 Mumbai Indians had beaten them with 37 balls to spare at Mumbai in 2008. – 44 Runs scored by Chennai Super Kings in the last 10 overs – the least for any side facing their full 20 overs in IPL 2012. 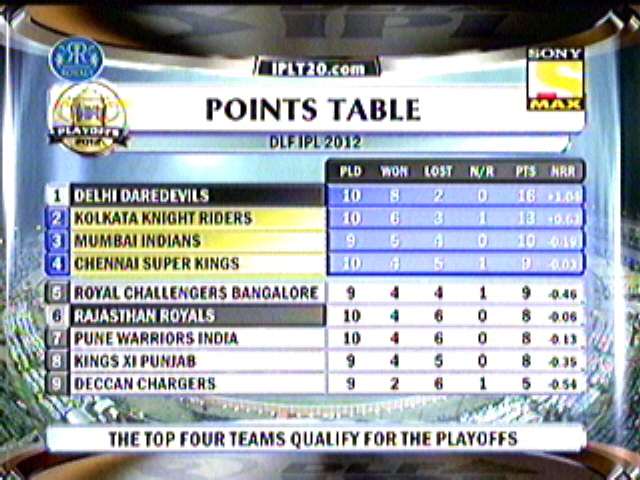 – 110 for eight – Chennai Super Kings’ lowest total against Delhi Daredevils. 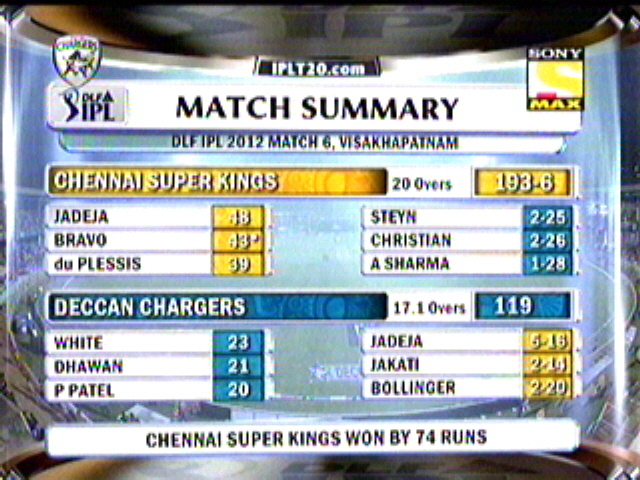 They had made 112 for nine at Chennai in 2010. 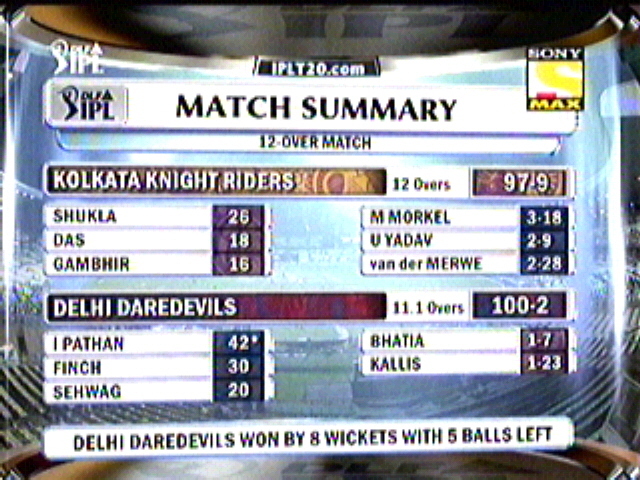 – 60 Runs scored by Kolkata Knight Riders in the first six overs – the maximum by any side in IPL 2012. 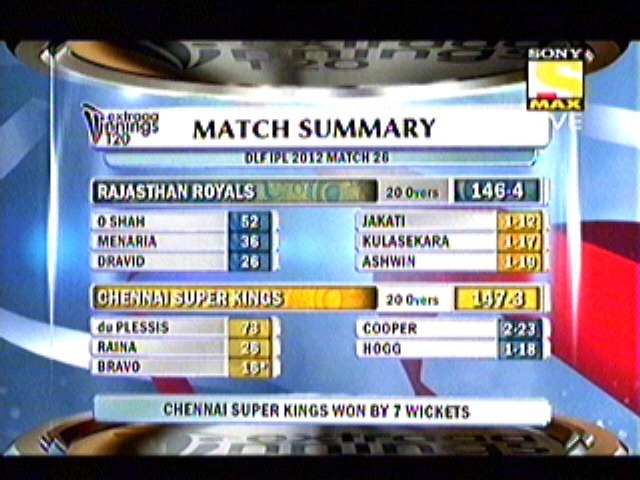 Rajasthan Royals had made 57 against Kings XI Punjab at Jaipur on April 6. – 28 Number of balls taken by Gautam Gambhir to reach his fifty – the fastest fifty in IPL 2012. Mumbai Indians’ Richard Levi had taken 34 balls against Chennai Super Kings in the opening game. 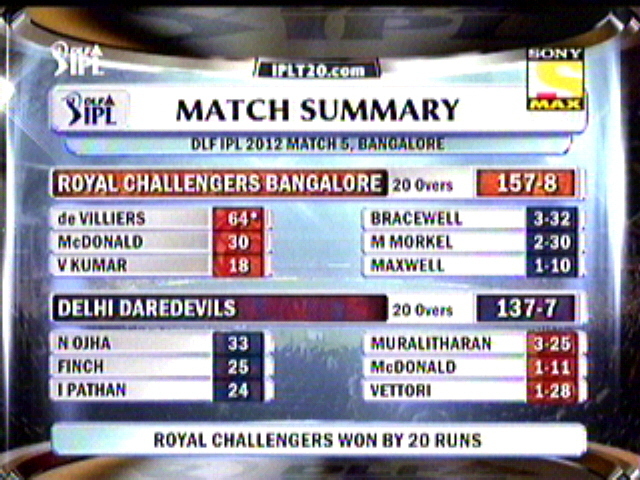 – 10.3 Overs taken by Royal Challengers Bangalore to reach their fifty – the slowest team fifty in the tournament. Mumbai Indians had taken 10.1 and 10.2 overs against Pune Warriors India on April 6 and Deccan Chargers on April 9 respectively. – 10 Number of bowlers to take 50 wickets in IPL. Zaheer Khan became the latest entrant to this club with the wicket of Gambhir. – 6 Number of batsmen to aggregate 1,500 runs in IPL. Gautam Gambhir joined Suresh Raina, Sachin Tendulkar, Adam Gilchrist, Rohit Sharma and Jacques Kallis in achieving this feat. – 2 Number of bowlers to take three four-wicket hauls in IPL. L Balaji is the latest – Anil Kumble was the first. – 100 Shewag scored the 100th six of IPL 5. Last Year’s runners up RCB will look to clinch the title this year, on the other end we have Shewag’s team which won the rain albeit game against KKR. Will the winning momentum in swing their favour. Definitely coin swung in their way and they decided to field first, Chasing being the winning formula. As expected Bowler’s provided with much needed strikes for Shewag, still AB de Villers kept hanging in the other end and got closer to 1578, a defentable total for their bowlers. After winning last game, DD’s should have gone into kill, but Shewag went for an early duck, which slowed down from then on, and Murali & Dan Vettori applied the brakes more swiftly and DD’s crashed instantly, and RCB won the game by 20 runs. Depleted Deccan Chargers takes on wounded Chennai Super Kings, home ground for Deccan’s have never been an happy hunting ground, still toss went in their favour, and again Cameron White decided to field first. Even though CSK had a slow start, Now and then every other player pressed the runs button, starting with Du Plesis, then followed Badri, Jaddu & finally Bravo finished with flourish to get the highest score of the season 5. Needing to bat out of the skin, Deccans’ started going for everything, didn’t mind whether its coming on to bat or not. Most of the times result on this type of games are most expected only, and here it was a 74 runs victory over the opposition. 2 Million Dollar man, Jaddu won the man of the match award, and justified his money. – AB De Villers scored 1000 runs in IPL career. – Aaron Finch became the first player to start the innings with a boundary. – Virender Shewag was out in the first ball for the third time and he has also been out oon the second ball two times to add up. – Till now only 1 Maiden is being bowled in IPL season 5, and its none other than L.Malinga. – Daniel Harris, who made his debut for Deccan chargers, is actually a Doctor in profession, who has a hospital running in South Australia. – Bravo went past 500 runs in his IPL career. – After Devon Cooper, Today Danial Harris started his IPL career with a Boundary to his name. – 193/6 is the highest total of this season, bettering yesterday’s best 191/4 by Rajasthan Royals. – 102 Meters six is the longest six for this season, Jadeja being the long runner. Orange Cap – A.Rahane (98) followed by I.Pathan (66). Its time Delhi mates lock horns against each other… Rain gods weren’t kind enough to start the game in time, as it was pouring cats & dogs till 9.30 pm, and then it eased off, great efforts from groundsmen made possible to have a 12 over game finally. Shewag won the first battle and decided to field first, KKR had a disastrous star if u could say so, they were 4 down, even before 4 overs could complete and Skipper was left stranded at the other end, It didn’t matter much as Gambhir also left to some Brilliant bowling by Morne Morkel. Shukla made few last minute glitches to make KKR’s total look defend-able. Aaron Finch and Shewag got Delhi to a good start, and runs were coming in ease, looked Delhi will win it with 10 wickets to spare, but Kallis removed Finch, and the very next over Bhatia took out Shewag and 2 quite overs in the middle meant, run rate was over 10 and needed a big over to pull it back, Oh Boy, Pathan got promoted up the order today, and he made justice to it, score 3 amazing sixer’s to win the game for Delhi comfortablely with 5 balls to spare. – 30 runs scored by Aaron finch is also his Best IPL score, his previous best was 23 runs. – This is first rain curtailed match of this season; all the seasons had matches curtailed by rain gods. – Marchant de Lange – South African fast bowler made his debut for KKR today. 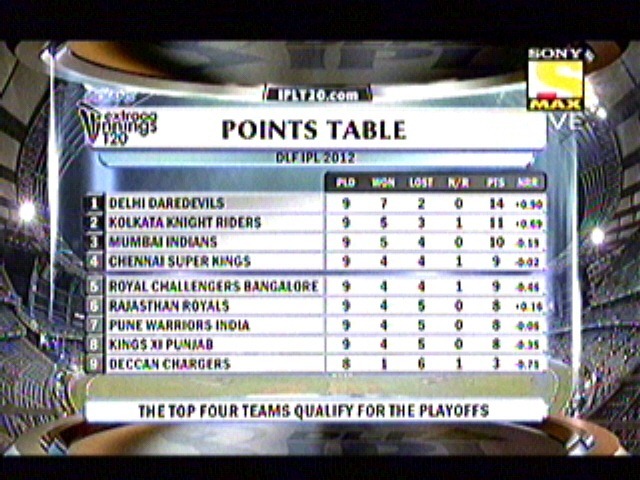 – Last season, Delhi has lost both the matches played against KKR in the same venue, and both times they were chasing. 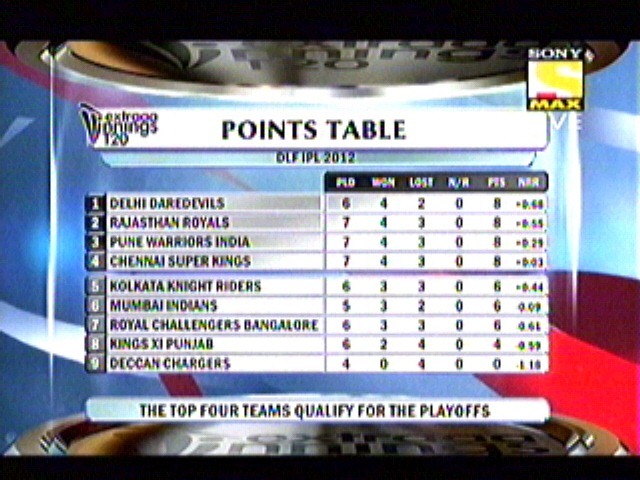 – A point to note Delhi Daredevils were the Wooden Spooner’s of last season. Orange Cap – Richard Levi (50) followed by Irfan Pathan (42).